To turn to the second matter, my argument is as follows. The Secretary General’s continuing to commission report after report against Sri Lanka, with “war crimes” as the theme, tends to create an impression in the minds of persons in the outside world, especially persons who may not have extensive or detailed knowledge of the specific issues or events in question, that the Government may in fact have some deep, dark secret it is hiding about the war. In other words, it prejudices or poisons the minds of persons in the outside world against Sri Lanka. But what if, like the famous “weapons of mass destruction” in Iraq, there is no deep, dark secret about the war? If Iraq proved anything, it is that in an atmosphere of prejudice and suspicion, it is often possible to get persons in the outside world to approve, endorse, or otherwise go along with various measures against a country that it is difficult if not impractical to pursue if no such prejudice existed, and where, in a manner of speaking, “cooler heads” could prevail. I feel that if sufficient prejudice is generated against Sri Lanka in the international community, it may be possible to get the international community to approve various measures against this country also, measures they would be reluctant to approve or endorse in a less charged atmosphere. I am not saying that any particular country is plotting such things at present, but reason, common sense and the experience of other nations especially in recent years indicate that such things are possible. The Secretary General cannot be so naïve that he doesn’t also recognize this possibility. If a person who can reasonably be expected to recognize that his actions might lead to harm, does not stop those actions but continues them, he or she is at some level responsible for that harm were it to occur later on. My point is this: if the Secretary General’s focus on “accountability” is exploited by a third party to subvert or destabilize this country, by facilitating such subversion, the Secretary General also becomes party to the “crime.” Hence, his actions become a violation of Article 2(7). I have in this section looked at the Secretary General’s culpability from three angles. I showed that his own stated legal basis for his actions is insufficient and flimsy at best. I then showed that there is simply no way he can resort to Article 99 to justify his actions, either. That leaves him with absolutely no legal basis for his actions. I also showed that he may be violating Articles 100 and 2(7). With regard to the former, I indicated that the onus is on him to explain away certain suspicions that arise as to his conduct, and that if he fails to do this, an inference of guilt can be drawn against him. With respect to Article 2(7), I showed that his actions are, one, an ex facie violation of the Article, and two, that those actions can also constitute a violation of the Article if they facilitate or aid the efforts of third parties to subvert or destabilize Sri Lanka. Such then is the Secretary General’s culpability. Is there a remedy? I start with a simple premise: nothing makes officials quake in their boots more than the imminent prospect of being hauled up before a court of law. So, my recommendation is this: Sri Lanka should go before the International Court of Justice and ask for an Advisory Opinion on whether the Secretary General has acted within the law with respect to his “accountability” quest in Sri Lanka. The ICJ statute, enacted along with the UN Charter, and in fact an integral part of the latter, says, “The court may give an advisory opinion on any legal question at the request of whatever body may be authorized by or in accordance with the Charter of the United Nations to make such a request.” Sri Lanka is perfectly within its rights to take the aforementioned matter before the court. What are the advantages and disadvantages if Sri Lanka were to go before the ICJ? That is the crucial question. It seems to me that from the Government’s point of view, the biggest disadvantage, and perhaps danger, is that the court might say the Secretary General’s actions are legal, in which case he would be in a far more solid position than he is in now to continue his actions. In my view, however, he will continue his actions to their logical end—i.e. to compel an official investigation into the last stages of the war—regardless of whether he had the ICJ’s affirmation or approval. So, as far as the Government is concerned, it really wouldn’t make any difference whether or not he had the added help of an ICJ ruling to give the imprimatur of a legal basis to his actions. On the other hand, what are the advantages of filing the case? What would happen, for instance, if the court were to rule against the Secretary General? Clearly, he will have to stop his accountability quest: it is one thing to act without explicit ICJ approval, but quite another to act if there was explicit disapproval. He simply cannot continue a course of action if there is an ICJ ruling that says that his actions are a violation of the law? The advantage to the Government, therefore, in taking the matter before the ICJ is that if the court rules against the Secretary General, his accountability “quest” will be well and truly finished. Sri Lankans, meanwhile, can finally put the war behind them, and get on with their lives. There is another advantage, related to the above, that I want to mention. Let’s suppose, for a moment, that the case is filed, and the Secretary General is called before the ICJ. Can we imagine something of how the case will proceed? The court will no doubt ask him, among other things, “Why do you say that the Sri Lanka Government committed war crimes?” To this, he will answer with something like, “Well, there are allegations.” The court will then ask him, “What allegations, and how did you come upon them?” The Secretary General will then have to produce not just his “reports,” but the evidence his experts relied on to come to the conclusions they did in those reports. And at that point, I suspect, the Secretary General (and his legal advisors) will start to sweat. 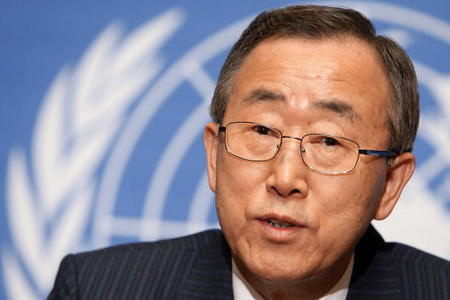 Those willing to petition the UN for an international war crimes inquiry targeting Sri Lanka had the choice of over two dozen sample letters prepared by the anti-Sri Lanka Lobby, to be sent online to UNSG Ban Ki Moon’s Panel of Experts….The POE in its March 2011 report on accountability in Sri Lanka revealed the receipt of over 4,000 submissions from some 2,300 senders. However, the POE has denied access to material in its possession for a period of 20 years. I did not mention these claims before in my arguments in this paper because I wanted to take the Secretary General’s own allegations at their strongest. I did not want to challenge his allegations at their root: I wanted to show that even if one took the allegations as they stood, he had not established a prima facie case with respect to them. But if the court is to assess whether or not the Secretary General acted within the law in pursuing accountability in Sri Lanka, and if the Secretary General is saying that he undertook his accountability quest because of allegations of war crimes, the veracity of those allegations become a crucial issue: as I mentioned earlier, the court will have to consider how he came upon his allegations in the first place. The problem so far has been that no one can prove definitively that questionable methods of evidence-gathering were used: the POE has ensured that all their material is sealed for twenty years. But if the ICJ wants to see the record, the Secretary General can’t go before the court and say that the record is sealed for twenty years. The court will be compelled to ask the Secretary General to unseal the record, even partially, so that at least the court can take a look at what’s in it. And what if it turns out that the rumors as to the questionable methods of evidence-gathering are true? What would that do to the Secretary General’s credibility, the credibility of his “experts”, and generally, the credibility of all the rest of the critics who have been screaming for “accountability” in Sri Lanka? It will truly be the end of the road for all of them. In my view, therefore, the advantages of filing this case far outweigh the disadvantages, and therefore the Government should go ahead and file it. From the point of view of a general reader, it would be a marvelous civics lesson to the world. It will be a chance to put to the court certain very important questions of law, not just on the scope and limits of the Secretary General’s powers, but also certain broader issues, touching on the position of the Charter with respect to interference in the internal affairs of nations, on humanitarian law, and so on, all relevant issues on which clarity and substantive commentary is so desperately needed, especially today. From the narrower perspective of the Government, I am sure it will be a marvelous opportunity to seize the initiative in the “accountability” imbroglio. Thus far, the Government has allowed the Secretary General and the critics to set the pace and the tone of the debate, and no doubt has been suffering for it: a good attack, it is often said, is the best defense. Dharshan Weerasekera was born and raised in Sri Lanka, but educated in the United States, at UC Berkeley, and at the University of Iowa. He has worked briefly at the Sri Lanka Defense Ministry. He later attended the Sri Lanka Law College, and is presently practicing as an Attorney-at-Law. His book, The UN’s relentless pursuit of Sri Lanka, was published in July 2013.